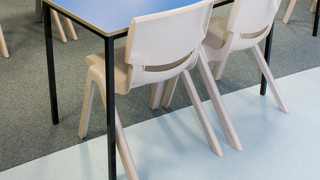 Over the years, we’ve found ourselves in constant contact with flooring dealers and school systems across the country, working to provide safe flooring accessories for primary and secondary schools, colleges, and universities. 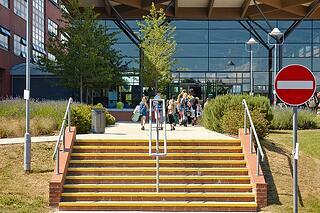 Most often, these educational facilities select products from the Gradus line of stair nosings and transition strips. While there are many alternatives on the market, our customers frequently come back to us for Gradus products simply because of the need for a high quality product. 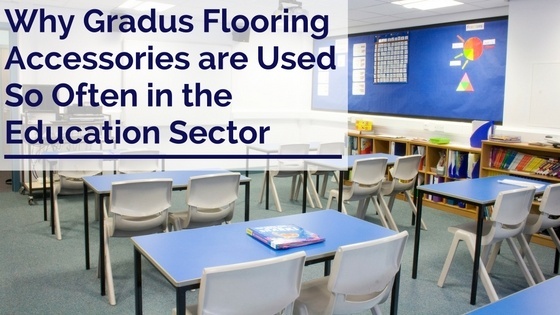 Let’s look at a few specific reasons why Gradus flooring accessories continue to be a superior option for the education sector. When a facility is being built or remodeled, the facility manager wants to make sure that the products that are used will be long lasting and economically appealing. This is especially true in schools. 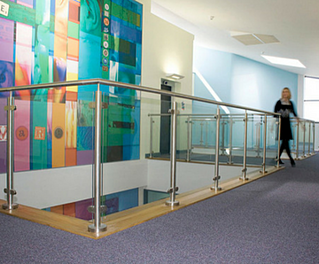 Several times, we’ve seen a school select and use an alternate product because of lower pricing, only to have the school come back later to request that the alternate product be replaced with our Gradus products. Of course, there are other profiles out there that will work, but our experience has shown that Gradus quality truly makes its products superior and worth the investment. 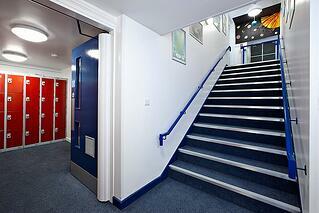 Most of the Gradus stair nosing profiles are covered by a ten-year warranty. This gives the facility manager, architect, and flooring contractor confidence that the products will hold up over multiple years of heavy traffic. One of the main functions of a stair nosing or transition strip is to provide a safe edge to the step or a safe transition between two floor surfaces. For instance, if a stair nosing is used in a school, you certainly want to make sure that the product will stand up to the heavy traffic, as well as the possibility of small hands “playing” with the profile. Since the majority of Gradus stair nosing profiles are both glued and screwed to the floor, there is little chance of the profiles coming up. This is an extremely important part of an installation in schools. The more precautions that can be taken to insure a safe installation, the better. Further, Gradus transition strip profiles range from a simple one piece metal cover strip to heavy duty two-part profiles. There are many variables to help determine just what you need in the line of transition strips in a school. We’ve had great success in several school systems with our “Clip-Top” line of two piece transition strips, which consist of an aluminum base that is glued and screwed to the floor and a PVC top that is tapped down into the base. While appearance may not be the most important thing when you’re working within the education sector, it doesn’t hurt to have a wide variety of finishes and colors. Many school systems, colleges, and universities that like to stick with their school colors throughout their décor. This includes carpet, tile, and flooring accessories. Since the Gradus product line is so expansive and the profiles are available in multiple colors and finishes, they are a perfect fit. We can work with most schools to find colors that match or compliment their color scheme. The great thing about working on project in the education sector is that they typically plan in advance based on their budget. This means that a school will be able to order the products it needs well in advance of the beginning of the project. Even when the products are needed quickly, we can usually work with the facility manager or flooring contractor to get the goods delivered in time for the installation. The standard lead-time for shipping Gradus flooring accessories to our customers is 2 to 2 ½ weeks after credit approval or prepayment of the order. This is more than sufficient for most projects in the education sector. With all of the growth in our country, the need for more and more schools will continue. This makes the education sector a very important market for any company that supplies products for new builds or for refurbishing existing buildings. If you’d like more information about our Gradus line of flooring accessories, download the catalog below. And, of course, contact us any time for a quick consultation if you have specific questions.